Herbs to make a bouquet garni can be grown at home and used later for cooking. All these herbs you can grow in the garden or on a suitable windowsill. The ingredients for our basic Bouquet Garni are the herbs Parsley, Thyme, Bay and a clove of Garlic. Tie them together with undyed string. Then add other herbs that are specific to the dish you want to cook. Use the herbs that are fresh and in season. If you have dried your own use sparingly to test the strength of flavour. Herbs with high oil content can withstand longer cooking in stews and casseroles and include Rosemary, Oregano, Sage and Bay. Loveage and parsley also retain flavour during lengthy cooking and combinations of stronger flavours are good for cooking meat dishes. Poultry blends well with lemon flavour so lemon thyme, lemon grass leaves (harder to grow) and lemon balm will add the flavour you seek. You can also add a mixture of summer savoury, tarragon or hyssop. Fish combines best with soft leaved herbs. Fennel, tarragon, dill and sweet marjoram are suitable as can be mint or welsh onion. 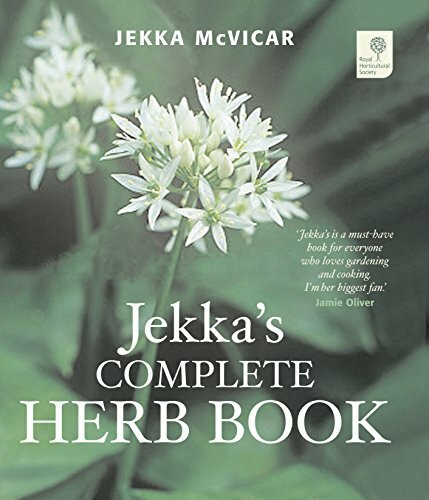 Jekka McVicar runs her own organic herb farm in Bristol and is the author of many books about herbs including ‘Jekka’s Complete Herb Book: In Association with the Royal Horticultural Society’ shown above. The sunnier the growing position, the better the flavour – the sun brings the oils to the surface of the leaf of many herbs. Your herb garden could be made in well drained garden or in containers. Jekka grows more than 600 species of culinary, medicinal and aromatic herbs at her farm.